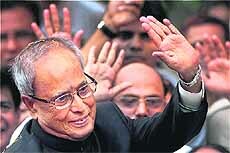 Ruling UPA nominee Pranab Mukherjee will be India�s 13th President. He will take oath in the Central Hall of Parliament on Wednesday at 11.30 am. A high-voltage situation prevailed for several hours following a violent confrontation as irate villagers tried to block the Delhi-Jaipur national highway (No. 8) and police personnel deployed at the site stopped them from doing so here this afternoon. With a deficient monsoon jacking up input costs, farmers in Punjab are staring at a crisis. In view of the use of diesel for irrigation, input costs are likely to go up to Rs 8,000 an acre, prompting the state government to urge the Centre to grant a Rs 800-crore interim package plus 1000 mega watt additional power allocation. India-born Lord Karan Bilimoria is among 37 business leaders who have signed a letter calling on the UK Government to do more to attract foreign students to British universities. Bilimoria, 50, earned his B.Com from Osmania University in Hyderabad before coming to the UK where he graduated in law from Sidney Sussex College, Cambridge, in 1988. Violence in lower Assam's Kokrajhar spread to neighbouring Chirang district today where five persons were killed, even as the toll in the group clashes shot up to 17 in the two districts. Jammu and Kashmir is fast emerging as the smoking capital of north India. Fresh analysis of tobacco prevalence data in the country has revealed that adults in J-K are spending more on cigarettes and bidis than their counterparts in other northern states.